One purpose of the entomology program is to conduct research in conjunction with other farm advisors, specialists, and University personnel that address key local pest management issues. 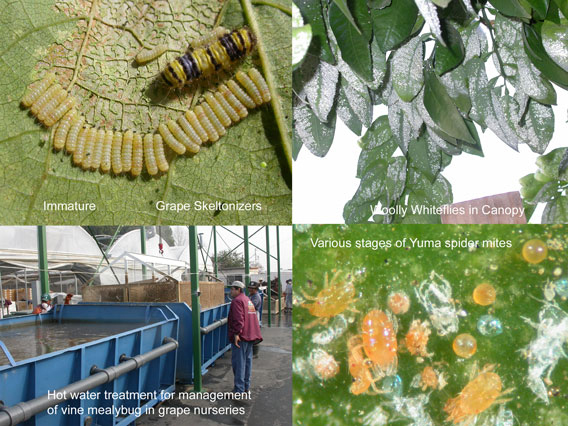 Below are links to current and past research projects being conducted through the entomology and pest management program in Kern County. Disclaimer: Discussion of research findings necessitates using trade names. This does not constitute product endorsement, nor does it suggest products not listed would not be suitable for use. Some research results included involve use of chemicals which are not currently registered for use, or may involve use which would be considered out of label. These results are reported but are not a recommendation from the University of California for use. Consult the label and use it as the basis of all recommendations.